Vitalect's Techniq™ Platform is seamlessly integrated with WebEx™ Training Center products. This means you can have one unified interface to administer, track and report on all your online learning offerings - self-paced, synchronous live sessions via the web, and a unique combination of both forms of learning. In other words, the end-user can login to the system and browse through a listing of courses that include Self-paced courses, Instructor-led training courses, Webinars (WebEx™ Training Center/Event Center), Podcasts, Videos etc. End-users can register for Webinars without ever visiting the WebEx™ Training Center site. This process can also be tied to eCommerce payment gateways and discounts through coupon management. In all the images dont show the URL field. Various forms of custom integration are possible with other web-based applications and services provided these services have published APIs. e.g., LDAP/SSO, eCommerce (Paypal/Authorize) etc. Those who wish to integrate all their training offerings under one self-contained "Online University" system. Those who are existing customers of WebEx™ and wish to provide self-paced and other forms of online learning. Those who currently use WebEx™ but would like to perform customizations around registration, coupons, eCommerce etc. Integration with other web based applications is an important aspect of any Software as a Service (SaaS) solution. 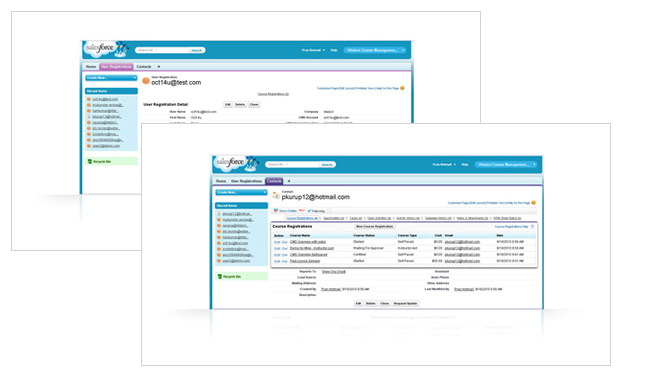 Our platform is integrated with Salesforce™, the leading CRM SaaS solution. If you are not an existing user of Salesforce™ this integration is not relevant to you. 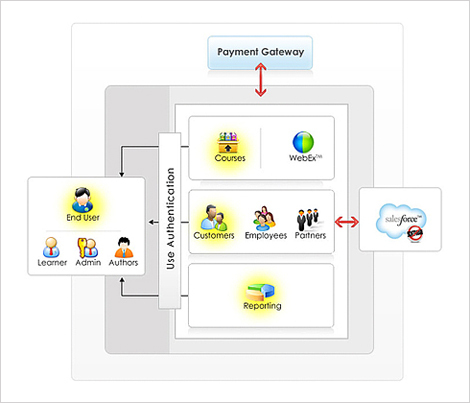 The simplest form of this integration involves communicating user and course information from our system to Salesforce™. For example, this means that users registered for training automatically appear in Salesforce™. Also, when a user purchases or registers for a course in our system the user details on Salesforce are automatically updated with the course information (type, cost, date etc.). Other forms of integration are also possible and can be implemented if required. Likewise integration with other web-based applications is possible provided these applications provide APIs.